As we saw in our first installment, the first Oldsmobile Toronado bowed in 1966, the first front-wheel-drive American production car in nearly 30 years. It won great critical acclaim for both its clever Unitized Power Package (UPP) drivetrain and its striking exterior styling, but public reaction was guarded. 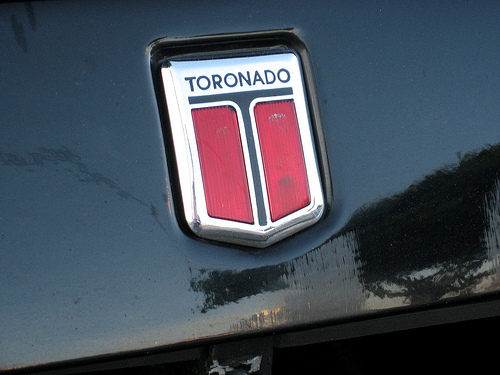 The Toronado soon developed a loyal following, but sales were consistently disappointing. If the success of the Ford Thunderbird was any indication, contemporary luxury car shoppers were more interested in a fashionable image than serious performance. Their idea of high technology was powered vent windows and banks of aircraft-style toggle switches, not front-wheel drive or cold air induction. The original Oldsmobile Toronado, based on a 1962 design by stylist David North, featured what GM designers called the monocoque look: the sail panels of its semi-fastback roof blended seamlessly into the rear fenders and flared wheel wells. This is actually a 1967 model, distinguishable by the eggcrate taillight trim and new wheelcovers, but its lines are little changed. 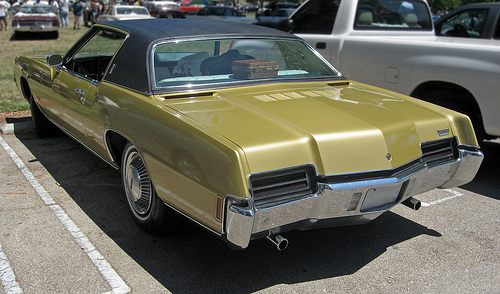 The grille beneath the rear window is the exhaust vent for the flow-through ventilation system — the Toronado and its Buick Riviera cousin had no vent windows, a real novelty at the time. By the time the Toronado received its first full redesign for 1971, Oldsmobile had seen the writing on the wall. If the first Toronado had been a high-tech answer to the dashing Buick Riviera, the second generation would be Lansing’s Eldorado: a posh personal luxury cruiser of which front-wheel drive was only an incidental feature. The search for a new styling theme was a protracted one involving several different styling studios. Although some accounts attribute the second-generation Toronado design to stylist Don Schumer, then in one of the Advanced studios, the design that eventually became the 1971 Oldsmobile Toronado actually came from David North, who had developed the first-generation Toronado. However, the second generation took a very different path from the first. 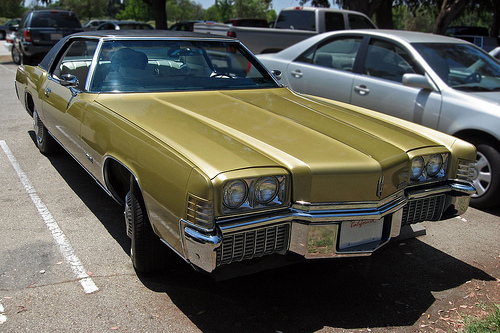 In fact, North says it began as a Cadillac Eldorado proposal. The 1971 Oldsmobile Toronado was 219.9 inches (5,586 mm) long on a 122.3-inch (3,106mm) wheelbase, making it 5.6 inches (142 mm) longer overall than the 1970 model. Curb weight was up about 80 lb (36 kg), totaling about 4,800 lb (2,177 kg) with a full load of options. A modest 1972 touch-up trimmed 0.3 inches (8 mm) from the wheelbase, but overall length grew to 220.3 inches (5,596 mm). Note the concealed windshield wipers, tucked behind the trailing edge of the long hood, a common GM styling feature during this period. The new Toronado dispensed entirely with the first generation’s fastback shape, which had been progressively toned down since 1969; the roof and rear fenders were now clearly separate. The result was a boxier shape that bore a more than passing resemblance to the contemporary Eldorado, particularly in profile, although the twin grilles subtly continued the first-generation Toronado’s nod to the Cord 810/812. If the Toronado looked more like a 1970 Eldorado than the bulkier, all-new 1971 Eldo, that was not necessarily a bad thing; Cadillac resale values were at their peak in the early seventies, so in some markets, a late-model Eldorado actually commanded higher prices than a brand-new Toronado. The Toronado’s greatest stylistic departure from the Cadillac theme was the front end, which was distinctly Oldsmobile. The Toronado once again shared its E-body shell with the Eldorado and Riviera. Previously, the Toronado and Eldorado had been semi-unitized, while the Riviera had a self-supporting cruciform chassis, but for 1971, all three cars rode a full-length perimeter frame, intended to provide greater isolation from noise, vibration, and harshness. Both the Toronado and Eldorado traded their previous rear suspensions, which had used single leaf springs and quad shocks, for trailing arms and coil springs, further reducing ride harshness. The Toronado’s damping and spring rates were now luxury-car soft, although the F41 heavy-duty suspension was still on the option list. 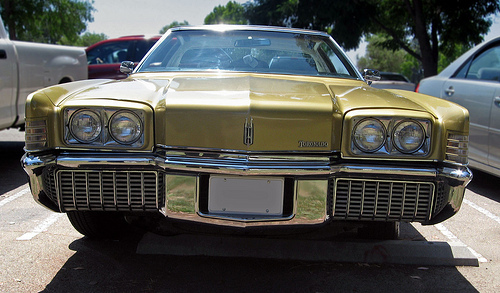 The 1971 Oldsmobile Toronado’s twin grille theme gave the front end kinship with the contemporary Olds Eighty-Eight and Ninety-Eight (although there was no danger of mistaking it for either), but the power bulge and fender-mounted turn signals are pure Eldorado. The 1971 model had 350 gross horsepower (261 kW), 275 hp (205 kW) in the new SAE net scale; the 1972 Toronado, now carrying only net ratings, fell to 250 hp (186 kW). The Toronado’s clever Unitized Power Package was little changed, but buyers who didn’t read the fine print might think the big 455 cu. in. (7,450 cc) V-8 had been completely defanged. It was now rated at 275 horsepower (205 kW) and 375 lb-ft (508 N-m) of torque, a nominal drop of 100 hp (75 kW) from 1970. Although the compression ratio had fallen from 10.25 to 8.5:1, part of GM president Ed Cole’s mandate to prepare for unleaded fuels, most of the drop was attributable to new, more realistic SAE net rating system; in the old SAE gross system, the Toronado’s engine was rated at 350 horsepower (261 kW). The powerful W34 GT engine, which had gone into around 20% of 1970 Toronados, was quietly dropped; the Toronado’s sporting days were over. The new Toronado didn’t make a great impression on the automotive press. While front-wheel drive was still rare in the U.S. market, it was no longer groundbreaking and the new Toro’s performance and handling were otherwise unexceptional. The 0-60 mph (0-97 km/h) sprint now took more than 10 seconds and unless you ordered the optional True-Track rear ABS, added late in the 1970 model year, braking distances were still hampered by premature rear lockup, a consequence of weight transfer onto the Toronado’s already heavy nose. The Ford Thunderbird, long the waftiest car in its class, now had a firmer ride than the Toronado and was notably quicker to boot. From an enthusiast standpoint, the Toronado had become decidedly dull. The second-generation Oldsmobile Toronado completely abandoned the original’s flowing sail panels, although it aped neither the 1970 Eldorado’s V-shaped backlight nor the ’71 Eldo’s opera windows; the latter would find their way onto the Toronado in 1975. For $205 extra, Toronado buyers could supplement the standard disc/drum brakes with the “True-Track” anti-lock braking system, introduced the previous year. Like the basically identical “Trackmaster” system offered on the contemporary Eldorado, True-Track worked only on the rear wheels. 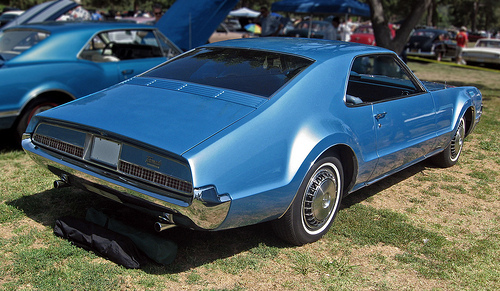 Four-wheel ABS would not become available on the Toronado until the late eighties. Nonetheless, the Toro’s newfound conservatism seemed to go over well with buyers. Despite a lengthy United Auto Workers strike that began just as the 1971 models arrived, Toronado sales showed encouraging signs of life, rising 14% from 1970. The Toronado was no longer winning any engineering awards, but if you wanted a reasonable imitation of a year-old Eldorado for about $1,000 less — and the waiting lists at Cadillac dealerships suggested that many did — it was a pretty good deal. All that I can say is thanks for your website. I remember a couple of years ago a co worker told me that a friend of hers had driven her home in her well used Oldsmobile Trofeo. I was impressed that in it’s faded opulence this Olds was still doing sterling service. My ’90 Trofeo is easily the best daily beater Ive ever enjoyed. Yet another great job by the author and this site, also! I saw a local dealer selling an empty shell version of the motor home in the late 70’s. Then whilr driving down to Florida to watch th 24 hour race at Daytona, saw one set up as a transporter, had a roll-up door in the rear. It had a Porsche in it. Does anyone know where the yellow 1977 Toronado XSR resides today? My intention is to preserve my 1977 Toronado Brougham for another 13 years and then give it to my son. It pleases me to see his appreciation for this car. It’s appraised at 98.3/100. if anyone out there comes across a front floor mat, please say so as I went and left mine in the sun and it faded! It is red. Also one hub cap has a small dent in it so… just say so if you know where I might find one. Sorry, I can’t advise anyone on finding parts or repairs — I really don’t know! Hopefully, one of your followers will know. I think your site is a great idea! That was a nice article, reading about “Toro’s” brought back a lot of memories. I worked as a Tech for Oldsmobile shops back in the early days, the 1967 was the first model I worked on as a current year and I worked on them to the end. I especially loved the early years with the HOT optional engines, the later ones ran like a Lead Sled. The Toro and 442 ran about even as my favorite Oldsmobile’s…. I have a 1969 Oldsmobile Toronado front wheel drive motorhome. Never seen anything like it! Can anyone tell me more about it? can send pics if nessessary. Hi Don, I worked on a number of GMC Motor homes that used the 455 Oldsmobile engine and the Toronado front drive unit but there were also several other manufactures who used the Oldsmobile FWD package to power their units. If you do a Google search for your brand and year you shouldn’t have a problem finding info about your vehicle. Cortez was another manufacture who used the Oldsmobile FWD. NASA actually used a Cortez to shuttle astronauts to the launch pad. Apparently there are still fans of the Cortez Motor home and parts are still sold by the companies owner, although no new units have been built for years. Search and you should find some info quite easily. I had thought from the research I did that Cortez didn’t adopt the Toronado powertrain until 1970 (although I’m no expert on motor homes, so I may be wrong in that! ), but I’m sure there were at least a few earlier examples, including probably some cobbled-together shade-tree jobs. The UPP concept made a lot of sense for motor homes and vans: enough torque to haul a substantial load, compact enough to not eat up interior space, and not so exotic you couldn’t get parts for most of it. I imagine the biggest obstacle to motor home use was likely the price. I’m not able to provide information on specific vehicles (I really have no idea), but there’s general information on the Motorhome in the text of the article. Has anyone contacted you yet with info ? If ot let me know we have a forum group and several clubs nationwide devoted to the GMC MH over 8000 are still running. Did virtually the same thing in Sept. Bought a 1976 GMC Eleganza II in Waxahachee, Tx. Been sitting at least 2 years. Washed it, new battery, electric fuel pump and ferry tank, and 1 new tire. Fired right up, lots of smoke, then drove to Lampassas. Brother, who has 4 of them, is still working on it. Looking forward to hitting the road with it. have inherited a 1973 travoy motor home. Model HSCR. Type 12J. It’s free. Pick it up in Yucca Vally, Ca.. Good shape. Tires old. Engine has not been run for 7-10 yrs. Housed in its own enclosed barn. I redacted your phone number — I really don’t recommend posting phone numbers online (except maybe a business number that’s publicly listed online anyway) lest you get besieged by robo-callers. If you’re determined, I will put it back, but I take no responsibility for the consequences! The Toronado died in 1986,the small 6 cylinder 1986 was grotesquely inferior to the great 1985 Toronado Caliente which was somewhat better than all the previous ones,the small one despite the gorgeous dashboard was not much more than an economy car,something affluent people disregard,it was gorgeous though compared to the contraptions being put out nowadays by all the manufacturers. The automobile is dying worldwide. If any xsc’s are for sale- I am interested. I still have my 79 that I ordered new 350 runs as smooth as the day it left the dealership! Anyone have problems with headlights i don’t have power on my 1969 head lights. I tested. Each one. Ands works. Low beams. Have 3 point. I can’t help with repairs or maintenance issues, sorry! I know that passing light is a little problem but whit a little fuse/ breaker/disjunctior is the problem solved! My husband was President of Revcon starting in 1976 and we loved the RV business and were involved with ElDorado/Honorbuilt Company from 1966-1976 when we moved to California. My family remembers being at the Dodger RV show and the Silver Bullet was a huge hit. I just picked up a 1975 Revcon. If you can share any pics or other info that would be great! Hmm, that’s very strange. I’m not experiencing that when I test it. Was the problem specific to this article, or did it occur on multiple pages? I have encountered a problem on certain articles where the WordPress media page (not normally accessible or visible to visitors) has disappeared or somehow broken without the associated image being gone, which creates a bizarre condition where the image loads, but also throws a 404 error that appears in the log. That doesn’t appear to be happening here, though. It may be a browser caching anomaly, where for some reason the page doesn’t completely load (due to a momentarily hiccup in the connection or browser lag), but then the browser has cached an incomplete version of that page and refuses to let go of it. That happens sometimes, and the only thing to be done about it is to clear the browser cache and try loading the page again. Since it’s a transient problem, it frequently has nothing to do with the actual page. It’s just an obnoxious side effect of the way modern browsers work. Nice story,but you have the design history wrong. don Schomer was a fine designer,but was not on this project. I had worked on the 66Toro with Olds chief Engineer John Belts who was then Olds Gen Manager for the 2 gen 71 Toro. He saw a scale model Eldorado proposal I did,and had me brought back from loan to Vaxhall in England. Cord look, the two lower grills made cooling a Chalange! Thanks so much for your input — I have amended (and hopefully corrected) the text. I’m sorry, I’m really not able to give that kind of advice. I don’t keep track of parts or repair availability or prices.